What are the steps you can take to ensure the safe use, storage and disposal of prescription drugs? Only take medication prescribed to you by a doctor. Only use it in the prescribed dosage. And never share prescription drugs with friends or family. Store prescription medication locked and out of reach of kids, family and guests. Know where it is at all times. Keep it in its original bottle with its label. Most prescription drugs should NOT be flushed down the toilet, washed down the sink, or put in the compost! 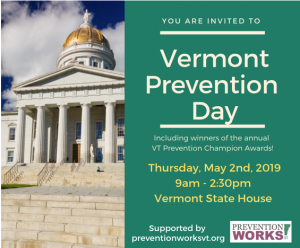 In Vermont, you can drop off your medications at a permanent disposal site. Proper disposal helps avoid harming water sources, wildlife, pets and people. Drop these items in an Rx Drug Drop Box near you. Collect your expired or unused Rx pills or patches in their original bottle or place them in a disposable bag. Be sure to remove or cover your personal information. Anonymously drop your pills and patches in an Rx drug drop box near you. Needles and Sharps: Needles and sharps cannot be collected at Rx drop boxes. Needles, lancets and syringes used for home health care are not regulated and can go in the trash. To protect workers in the waste industry, place all needles in a sealed container and label it “Sharps – Do Not Recycle” and store in a safe location, out of reach of children and pets. A plastic soda or laundry detergent bottle with a lid makes a good container. When the container is full, cap it tightly and throw in the trash. Liquids: Mix liquid medication with kitty litter or coffee grounds. Place mixture in a sealed plastic bag and place in trash. Liquids cannot be collected in the Rx drop boxes. 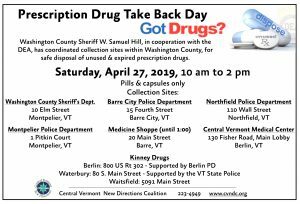 In Washington County there are drop boxes at the Washington County Sheriff’s Department, 10 Elm Street, Montpelier, VT and the Barre City Police Department, 15 Fourth Street, Barre, VT.
For more information about disposal instructions contact your local pharmacist or the FDA at 888-INFO-FDA. Or, visit the Disposal of Unused Medicines: What You Should Know page at www.fda.gov.